The Mini has come of age. Thirteen years after launch under BMW’s ownership, it’s finally launched the most maxi-Mini yet: the new five-door Mini hatchback. It’s not the first five-door Mini – the Countryman baby crossover saw to that – but it is the first time a new-shape production Mini hatchback has come with back doors. Why super-size the Mini, that bastion of cheeky, small car-kind? Because even Mini owners grow up eventually, and need the extra space. 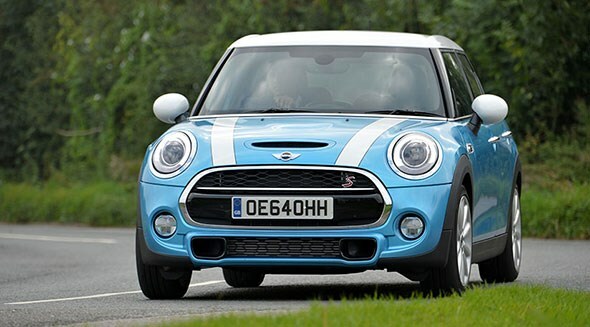 Read on for our Mini five-door first drive review. Mini has taken the regular three-door hatch, stretched the new UKL platform by 72mm and added some bigger clothes. End result? The five-door measures 162mm longer overall, but the wheelbase stretch brings a corresponding jump in rear legroom and boostpace. The inflated proportions speak for themselves – you’ll either love it or hate it, depending on your perspective and, most likely, historical allegiances – but there’s no arguing with the extra room onboard. The boot swells by 67 litres over the three-door’s and there’s nearly three inches of extra legroom for those in the back. It’s worth dwelling on the practicality issue at the top of this Mini five-door review. Aimed at young families and those who’ve outgrown the three-door, the extra room could be the difference between sticking with the Mini brand and shopping elsewhere. Find out why Mini predicts the three-door will remain the biggest seller here. Can you really fit more in the new five-door Mini? Yes. And no. The rear seats are surprisingly roomy now. It’s the first modern Mini homologated with five seats, although the middle rear pew is next to useless to all except babies thanks to a monster transmission tunnel and the narrow cabin. But you’ll easily fit a pair of tall adults in the back. Headroom is great and legroom is fair for a supermini, thanks to deeply sculpted seat backs. The problem is the rear doors. They’re tiny. Squeezing in and out can be tricky. And the boot? It’s certainly bigger than a three-door’s but its 278 litres are not exactly massive, struggling to carry even simple staples of family life such as a child’s pushchair (we ambushed some passing mummies and checked). There’s a clever split floor and the seatbacks can be adjusted in one of two positions so you can prioritise passengers or luggage. Mini 5dr review: what’s it like to drive? No worries on the dynamics front. The stretched wheelbase has done little to dent the eagerness of the Mini’s chassis and this feels every inch a member of the new Mini family. It’s bang up to date and doesn’t feel a few years off the pace in the same way that the even bigger Countryman can on occasion. We drove the Cooper S and Cooper S D – the only two engines available on the launch, both in automatic guise – and they’re equally strong performers. The 2.0-litre diesel develops 168bhp and 266lb ft, so is correspondingly rapid. It’s impressively refined and you’re barely aware of its derv origins, apart from during stop-start defibrillations. It’s highly flexible and they’ve engineered in some rorty fun noises to boot. But there’s no substituting the slingshot character of the petrol Cooper S (189bhp/221lb ft), which is a bit of a firecracker. Back in the real world, emissions difference of 30g/km of CO2 (depending on transmission/wheels/Munich magic) will elevate the diesel on most buyers’ shopping lists. Mechanically the five-door is identical to the smaller three-door and it drives in a similarly eager fashion. It’s pointy and agile, body roll is next to non-existent and you can chuck it around with Mini abandon. The only real dynamic grumble is a ludicrously firm ride on the 17in tyres (and our test vehicles cunningly rode on normal rubber, whereas customer cars will come with even stiffer run-flats, according to Mini engineers). There’s no knocking the quality of the Mini five-door. It’s beautifully built, feeling every bit the junior BMW. And the cabin is a big step forward, finally banishing most cheap plastics but keeping the stock Mini fare: newly super-sized toggle switches and that ludicrously massive centre dial, now an entertainment hub. Fitted with the top-spec sat-nav, it’s an impressive display. Get a tiny dot-matrix entry-level radio and it’ll look weird and empty. The Mini five-door brings an added dose of practicality to the Mini family that many families will welcome. That the extra pair of doors add just £600 to the price is welcome news. The cheapest Mini One five-door costs £14,350, our range-topping Cooper SD listled in the spec panel £20,050. It's a top-end supermini, alright. Downsides? Well the Mini-inflated-by-several-psi design won’t be to all tastes. Some may even compare it to the (whisper it) bloated Fiat 500L. And it’s annoyingly not quite big enough to fulfill proper family duties. We can see many potential owners reverting to type and buying a bigger Golf from the next class up for similar money. They’ll miss out on the Mini style, an entertaining drive and some cool trinkets, but will be choosing a more practical car.